Jessica Cook was recently named Mid-South Conference Freshman of the Year for cross country. POMEROY — A 2018 Eastern High School graduate was recently named Freshman of the Year in her conference for cross country. Jessica Cook was named the Mid-South Conference Women’s Cross Country Freshman of the Year as the top finishing freshman of the Mid-South Conference Championships meet. 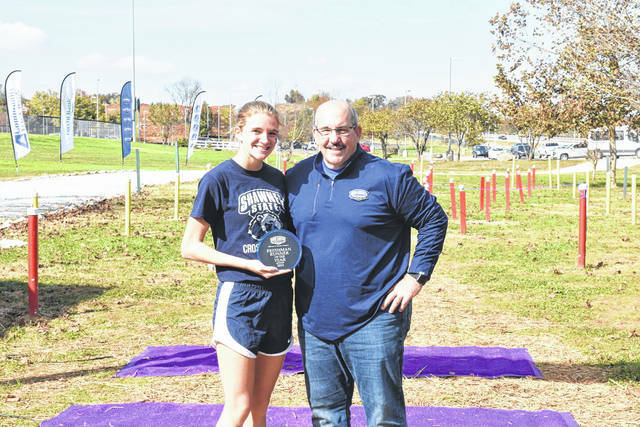 Cook runs as part of the Shawnee State Cross Country team which took home bot the men’s and women’s championships at the meet. Cook placed third overall at the meet with a time of 19:29.8, giving Shawnee State a sweep of the first three spots. With the first place finish by both the men’s and women’s teams at the conference meets, they advanced to the NAIA Cross Country Championships. Cook placed 120th of the 330 women’s runners at the NAIA Championships with a time of 18:53. Meigs High School graduate Hunter Parsons was an alternate for the men’s team which also competed at the NAIA Nationals. Information and photo from the Mid-South Conference website and Facebook page.